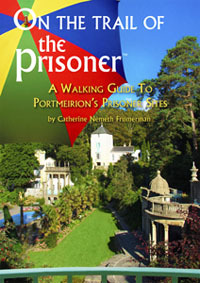 Fans of Portmeirion's part in "The Prisoner" will be delighted to hear that "On the Trail of The Prisoner - a walking guide to Portmeirion's Prisoner sites" by Catherine Frumerman, has been reprinted following the sell-out of its first run. Due to updated software technology and the utilization of a brand new, $250,000, state-of-the-art Canon printing press, the book is brighter with the pictures clearer and deeper. There are some additional photos (new and old) and the cover has been double laminated making it more water-resistant. The book is available from Portmeirion's Prisoner shop as well as online at Prisoner e-store PrizBiz. With thanks to Catherine Frumerman for this news item.